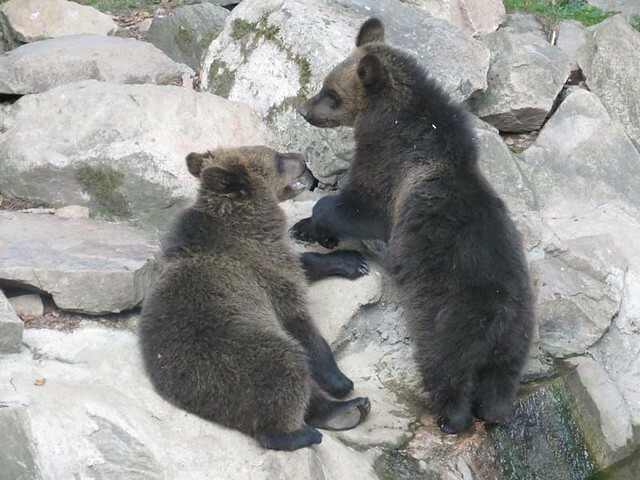 We tried to see the wolves, too, but they were hiding in the forest so we continued to the bears and we were met by this lovely sight – Ester was sitting there with her two cubbies Kivi and Koda. 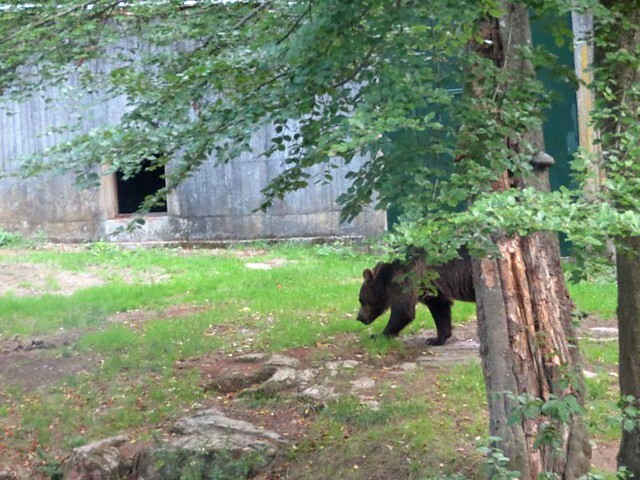 Maybe the bear family understood my dilemma because they came closer to the window. 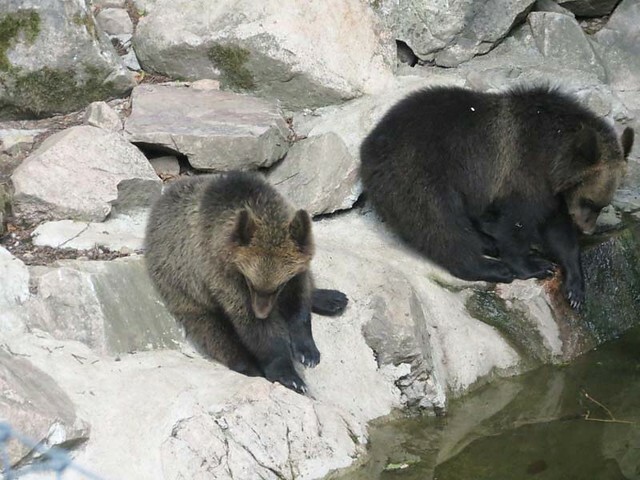 I don’t know which is which but my wild guess is that the darker, bigger bear is a boy that has inherited his looks from papa Glok and the smaller sweetie with the pale fur is a girl that looks more like mama Ester. 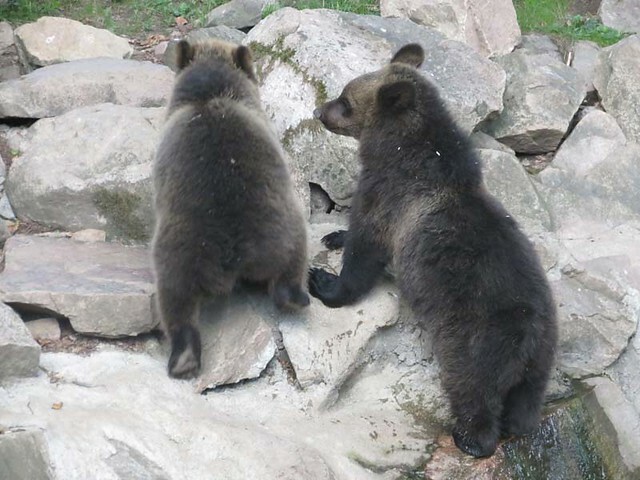 Bear cubs are lovely even when they turn their backs towards the visitors. Oh, those ears …..
Don’t you think it’s soon time for our lunch? 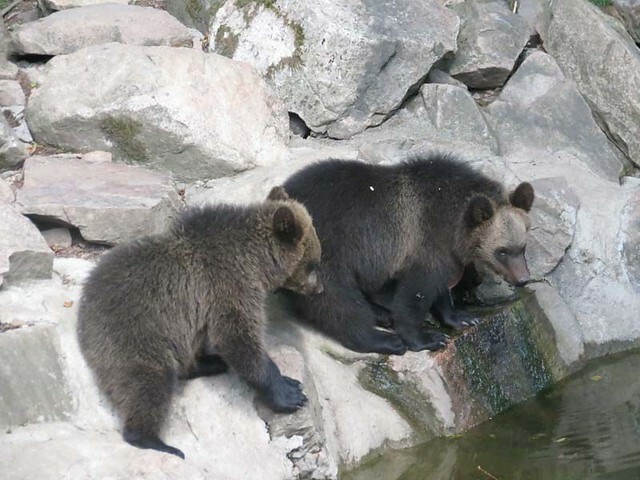 When Ester started walking towards the feeding place the cubs followed her. Unfortunately the place was behind the net fence so it was not possible to take photos. 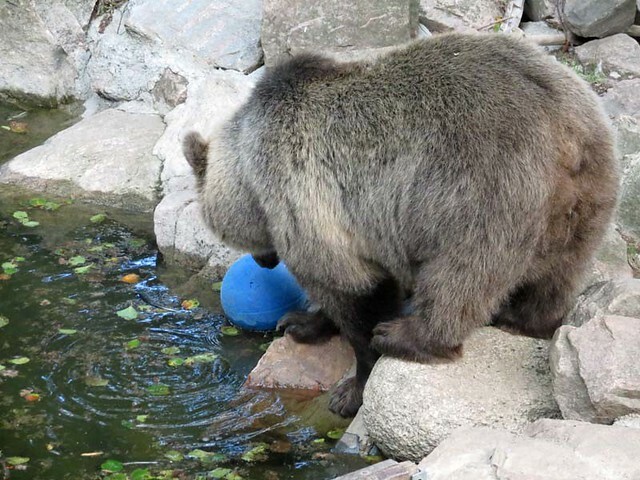 Glok lives the life of a bachelor in a nearby enclosure. 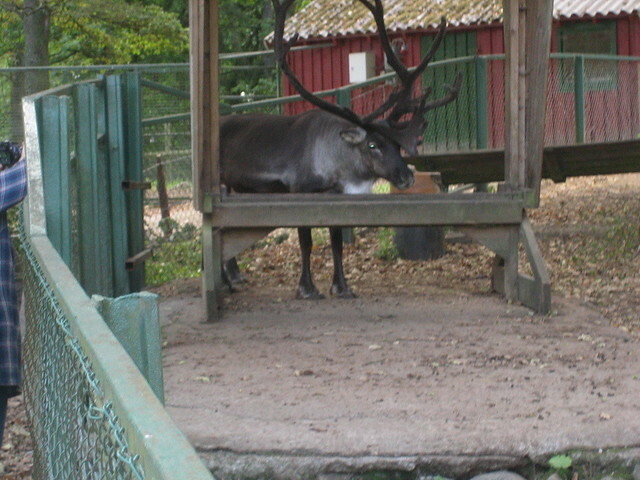 We found him lying behind a tree but the lunch apples his keepers had thrown to Glok made him move …. I think Glok’s facial expression reveals that the apples were very yammy. Are there more of the round yammies? Glok’s fur is very dark and under some light conditions it looks almost dark lilac. Very beautiful! 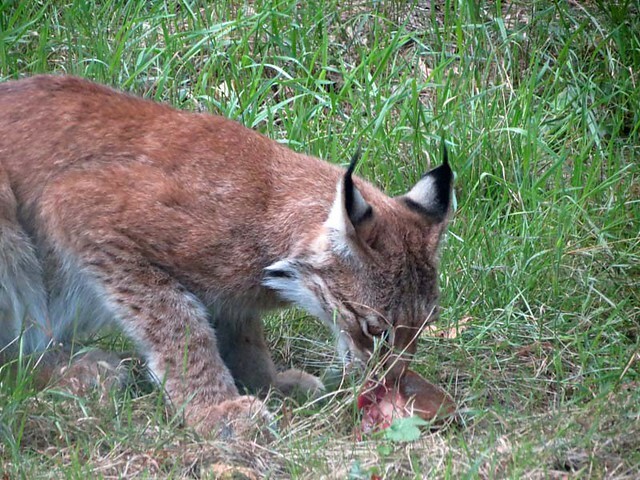 It was time to hurry to the feeding of the lynxs. 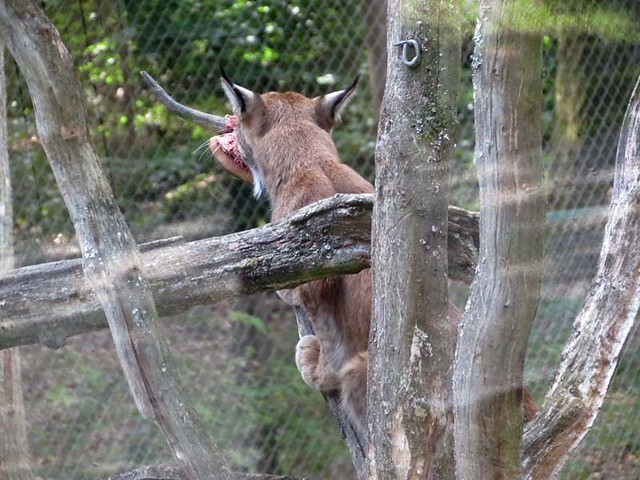 For the time being three cats are sharing the enclosure – Lotus, Opahlina and Loka. We could see two of them but again I must confess I can’t tell who is who …. but I can tell you one thing – these cats are very beautiful! We were a bit late because the keepers had already placed big pieces of meat on the tree. It didn’t take long for this beauty to bring the meat to the ground. He/she ate with good appetite. Occasionally he/she made sure there was nothing disturbing the lunch hour. 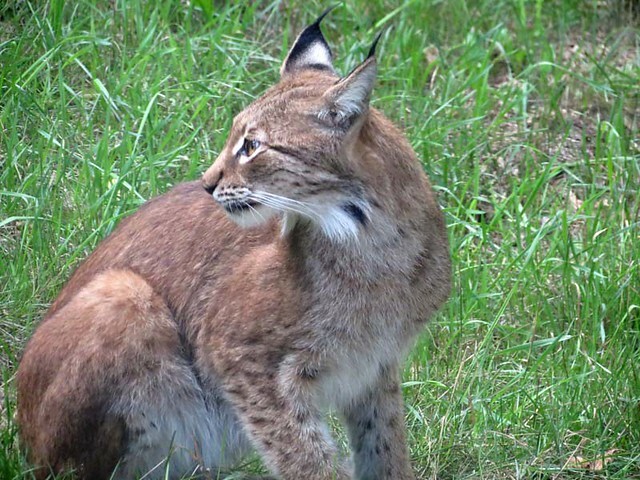 Then we could see another lynx approaching. These cats have very long legs, cute ears and a nice ‘beard’. Wow! Those horns are truly impressive! 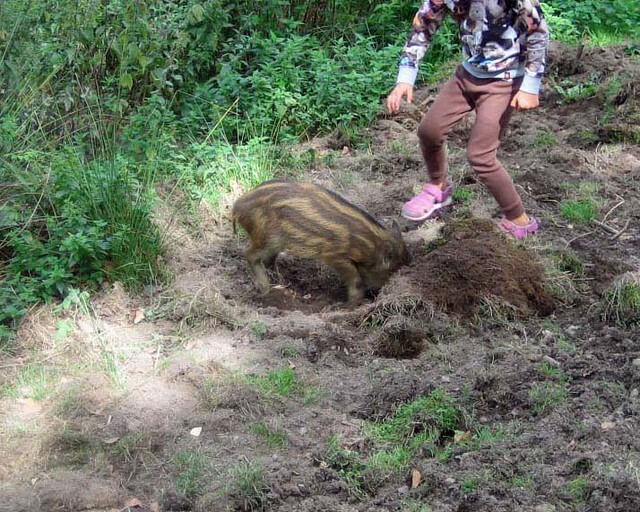 We were taken by surprise when we met wild boar babies outside their enclosure. They are allowed to be ‘free’ and it was wonderful to see them so close. They didn’t seem to mind children petting them but I hope the parents are keeping an eye on their kids so they don’t scare the sweeties. In a park like this it’s not easy to see all the animals during one visit but we were lucky seeing so many of them this day. Because we even were lucky with the weather conditions it was a perfect day! Ester has very nice kids. They are both very cute. The lynxs look beautiful. You took some wonderful pictures of them. The pigs are cute, but I would not pet them. I am afraid they have the sharp teeth. 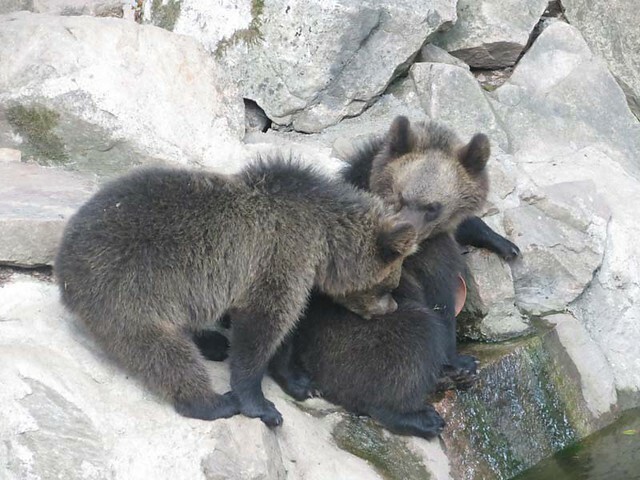 What a nice bear family! These small cubbies look like teddy bears! Glok looks very gorgeous bear father. The linx seems to be relaxed and of course, these scarecrows look good, too! Thanks for sharing your nice visit with us! Die jungen Bären sind hübsch und sehr fotogen. Mama Ester hat die Kinder gut groß gezogen. 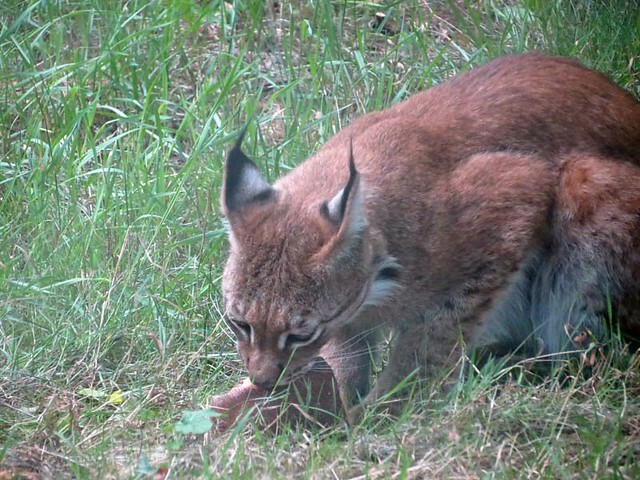 Luchse sind elegant – sehr schöne Katzen ! 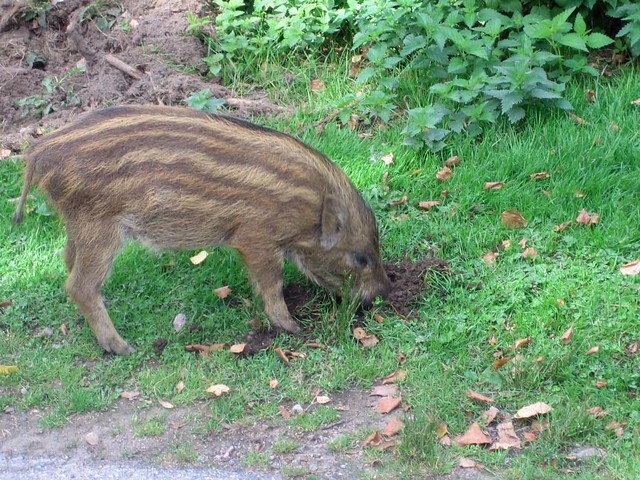 Die gestreiften Schweinchen sind niedlich. 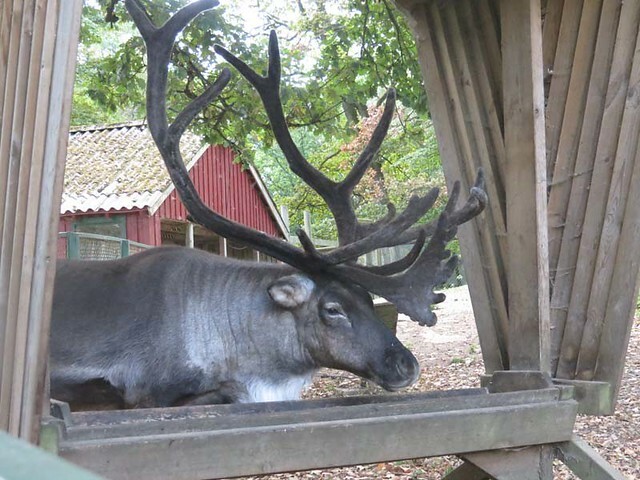 Thank you for the second part of the report about your visit in the Scania Animal Park! Since it is already the second part I´m impressed by the amount of great pics. 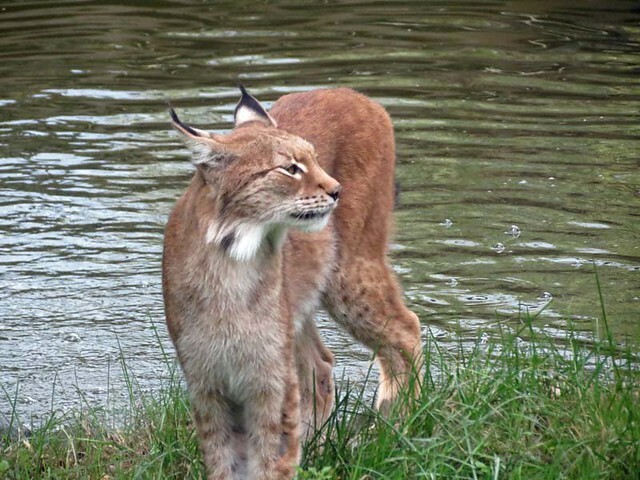 Though I liked the beautiful lynxes – fabulous photos! 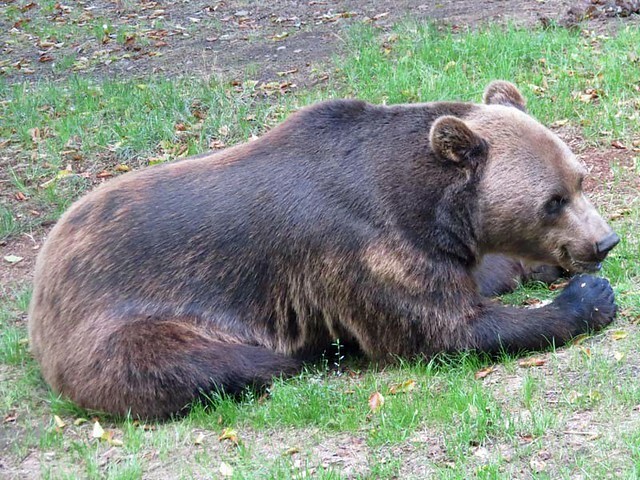 – as well as the nice framed reindeer or the little piggie my favourites are the members of the wonderful brown bear family. I`m green with envy that you can visit them in your nearby surroundings. By the way I loved the little ears of the cute cubbies! All brownies are good-looking and seem to enjoy life! That´s a nice photo of you at the end! You look good and quite stylish! 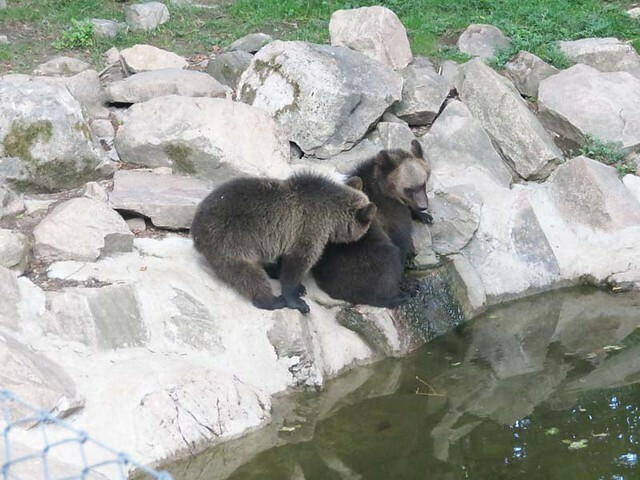 die Bärenfamilie sieht gut aus und das Foto mit den 4 kleinen Bärenohren ist mein Favorit! Wie schön, dass ihr sie so nah am Zaun sehen konntet. 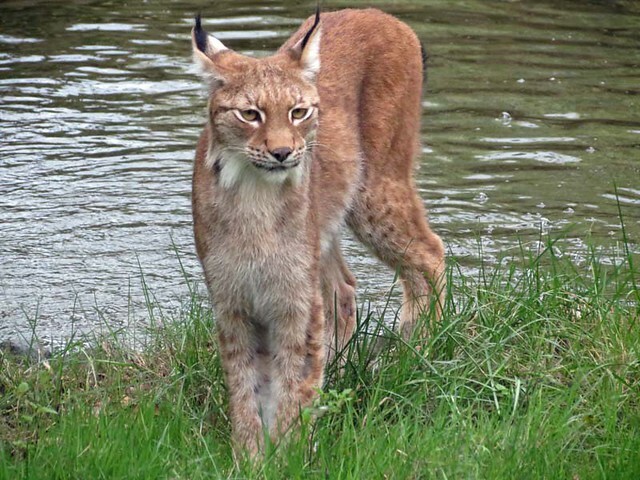 Der Luchs ist sehr beeindruckend und das Rentier sieht wirklich aus wie auf einem Gemälde. Ich benutze diese Stöcke auch beim Gehen, weil sie mir helfen, meine Atemmuskulatur zu entlasten. Die Leute denken aber nur: Ach, sie macht noch Walking, obwohl sie schon ein Sauerstoffgerät braucht? Danke für deinen ausführlichen Bericht und liebe Grüße! 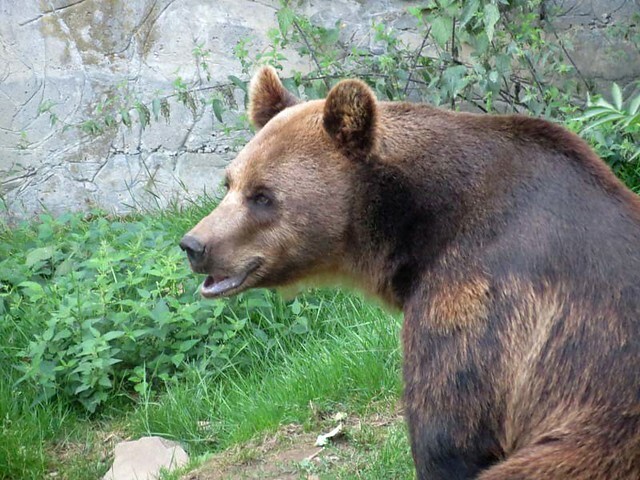 Danke für alle diese wunderbaren Tiere! Näyttää hyvin onneliselta karhuperheeltä tämä Esterin Glokin perhe. Lapsoset ovat jo aika isoja. Kiitos hauskoista kuvista kuten myös teksteistä. 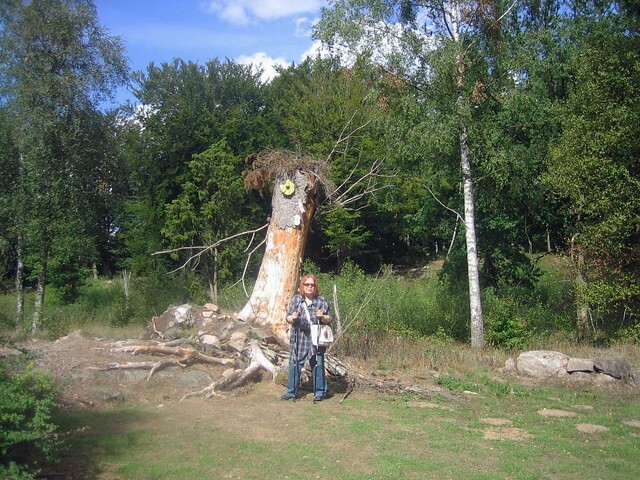 The ‘BROWNIES’ in the “Skånes Djurpark” in Höör are for sure very lovely, the whole family! 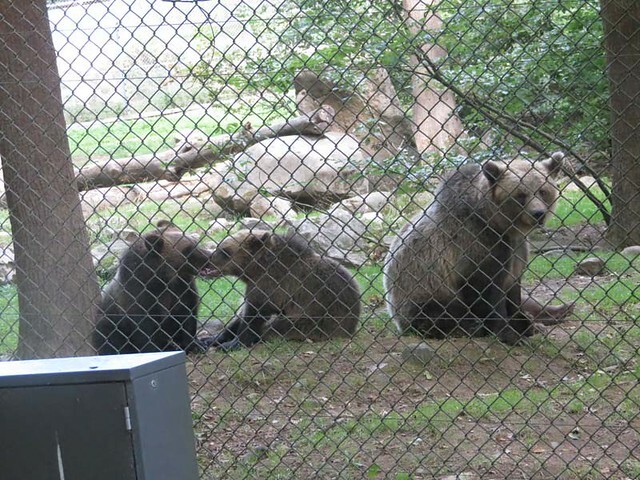 They’ve also got an interesting and ‘most rich in variety’ enclosure. Look at those rocks and how steep the hill towards the water is! But there is also a gentle meadow area . 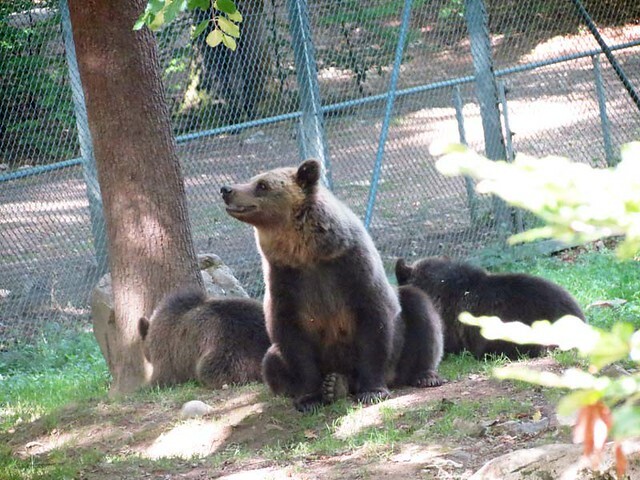 . . GLOK, ESTER, KIVI and KODA are friendly looking bears and I can well understand the both of you, dear MERVI and VESA did fall in love with all the four! (However, I am aware GLOK is your special darling! 😉 ). 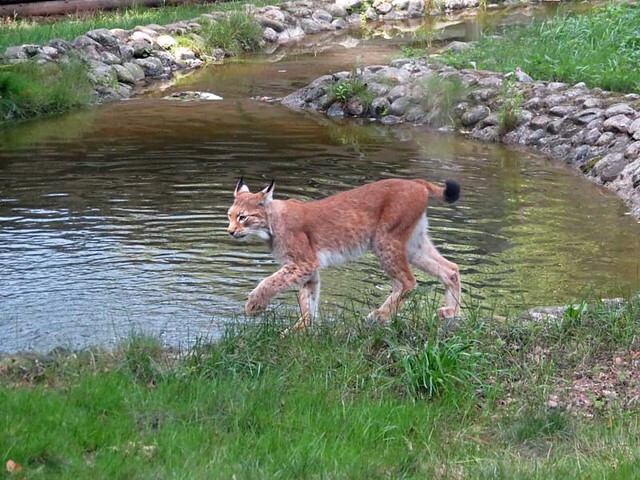 Did I ever tell I love lynxes!? Last time I saw one live was at the occasion of a ZOOM-visit in Gelsenkirchen which was years ago! Your pics of the beauties are great. It’s even good to see them only virtually . 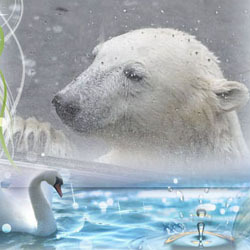 . .
Also the reindeer, the boar children and this last being shown are well caught into your camera! 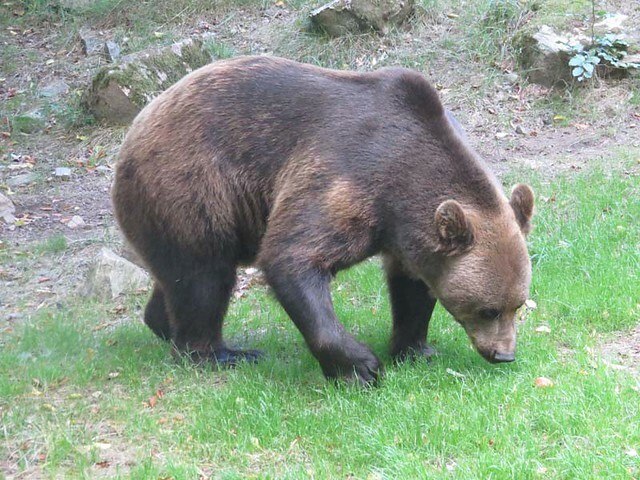 Thank you very much for the second part of your report of your visit to this nature-addicted animal park giving to people/visitors emotional well-being. . . .
What a wonderful Northern European family of animals in this report. All the animals look at home and well cared for. I can tell that you had a magical time. 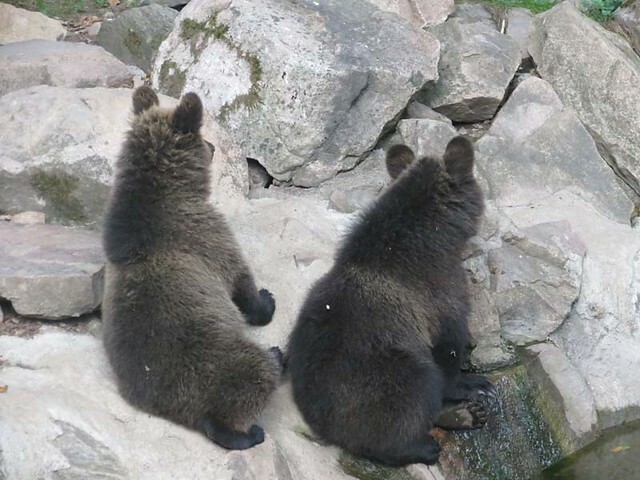 bei kleinen Braunbären schmelze ich immer dahin, für mich sind sie Krönung der Niedlichkeit! 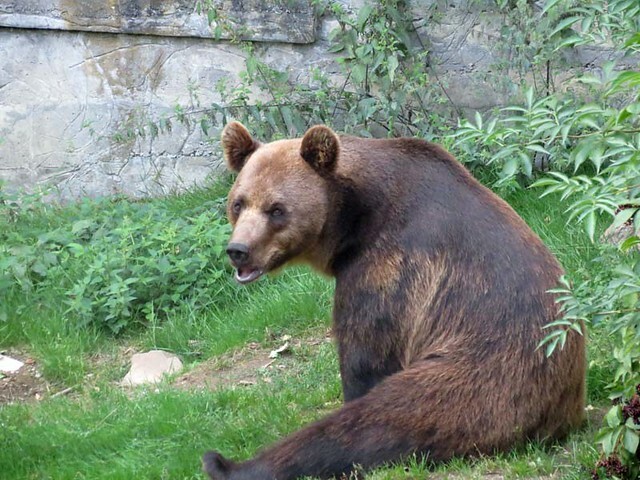 Glok ist ein schöner und beeindruckender Bär und muß jetzt noch einige Monate warten bis Esther wieder kommt. 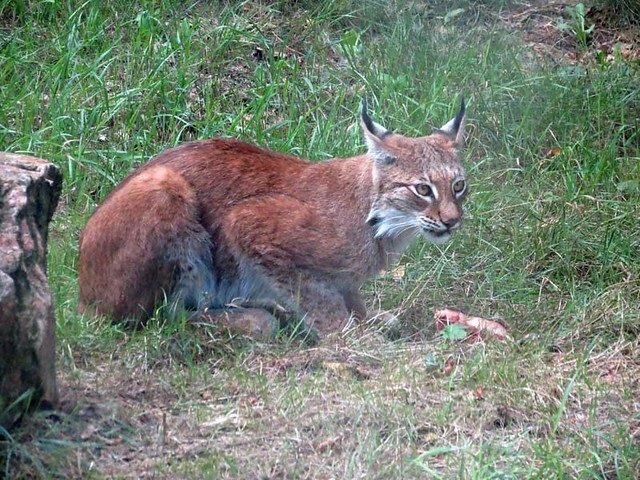 Luchse haben so schöne Augen wie alle Katzen sind sie einfach nur wunderschöne. Freut mich daß ihr so einen schönen Tag gehabt habt und uns so schöne Bilder zeigen konntet. Log in | 54 queries. 0.945 seconds.